We carry huge stocks of car and van tyres ranging from quality budget to leading brands, for FREE helpful advice call your centre. Savoy Autocentres supply and fit all leading makes of car tyres (and van / light commercial tyres) including Goodyear, Dunlop, Pirelli, Continental, Michelin, Bridgestone, Firestone, Yokohama, Lassa, Sava and many more. Just give us a call if you have a particular make you are looking for. Your tyres are your only contact with the road and they affect the steering, acceleration and braking of your vehicle. Tyres therefore need to be in as good a condition as possible so that your vehicle handles properly, is economical with fuel as well as being safe to drive. 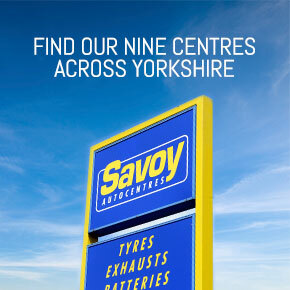 Savoy Autocentres offer a free tyre check, and we’ll also check / adjust your tyre pressures free of charge – just pop into any one of our depots and we’ll be pleased to help and advise you, without any obligation. The legal minimum tread depth, for cars and light commercial vehicles, is 1.6mm in a continuous band across the central three quarters of the tread width, this must be all the way around the circumference of the tyre. Our experienced staff will be happy to check your tread depth, free of charge, if you call in at any one of our depots. The tread is there to displace water from the surface of the road and to reduce the risk of losing control of your vehicle due to aquaplaning. Savoy Autocentres recommend changing your tyres once the tread wears down to 2mm, this gives you an additional safety margin and should ensure that you never drive with less than the legal minimum as penalties for driving with insufficient tyre tread can run into thousands of pounds and carry compulsory penalty points on your licence. Tyres should be inflated to the vehicle manufacturers recommend pressure in order for your vehicle to handle correctly and also to ensure that your tyres wear evenly and give maximum life. If your tyres are over-inflated, they will wear more in the centre of the tread, if they are under-inflated they will wear more on the outside of the tread. Just pop into one of our depots and we’ll be happy to check your tyre pressures free of charge. Certain types of damage to tyres can be both dangerous and illegal. You should have your tyres checked, either by yourself or professionally, at least once a month. If there are any cuts, tears, lumps, bulges, exposed ply or cord then, depending on how bad the damage is and where on the tyre it is, the tyre may need replacing. Wheels need to be balanced in order to give a smooth ride without any judder in your steering wheel, and also to protect your steering and suspension components. If your steering wheel vibrates when you are driving it may be that your wheels are not properly balanced. Just call into one of our depots and we’ll investigate. At sometime in it’s life your tyre may become punctured. A puncture results in the tyre being unable to retain the pressure within it and it will deflate unless of course it is a “run on flat” type of tyre. Not all punctures are safe to repair, but many are – we’re happy to advise if you call in to one of our sites. Where we supply and fit tyres, we also dispose of your old tyre in an environmentally friendly manner.